￭ELECTRONIC DISPLAY - 5 function display indicates exercise time, revolution count, revolutions per minute (rpm),calories burned and resetting button; also includes scan feature for all values. ￭ADJUSTED RESISTANCE - Resistance can be easily adjusted with the tension screw, allowing you to increase or decrease the strength of your therapy to meet your personal needs. Four anti-slip rubber pads prevent sliding and protect surfaces. 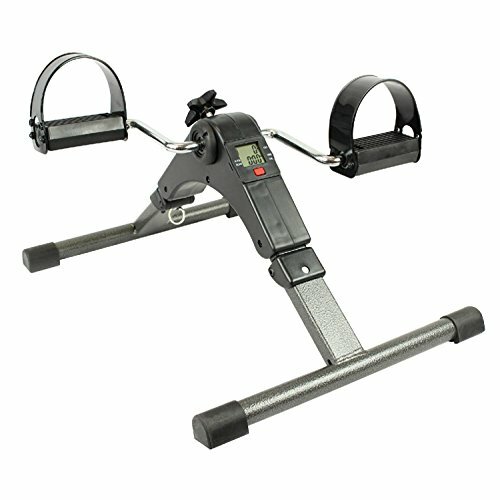 ￭DURABLE FRAME - Made with a durable chrome frame for stability on any surface with pedals resembling a bicycle in home gym for cardio training, featuring integrated straps to keep your feet firmly in place. ￭GUARANTEE - 1) Unconditional 1 Year guarantee for your purchase confidence. 2) We will provide 7x24 hours best service when you want to contact us anytime. If you have any questions about this product by JO, contact us by completing and submitting the form below. If you are looking for a specif part number, please include it with your message.